Daily, once the grates have cooled down you can wipe them with water, soap and a sponge (rough or smooth side). Then, turn the burners on and leave them for 10 minutes to make sure they are totally dry. 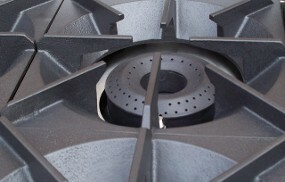 Ever so often you can lift off the grates and clean the drip pan under the burner. These drip pans are easy to remove and put back, so clean up is as easy as taking them to the sink, clean with soap and water, then replace. Drip trays are in two sectional pieces, if you have covered these trays with aluminum foil simply rip it off and replace, if not wash with soap and water, then replace. The grates are pretty much indestructible so don't worry about scrubbing them too hard. The key is DRYING them really well. TOP TIP.... All burner grates can go in the dishwasher, but always dry them thoroughly after the dishwasher cycle, putting them back on the range and turning it on for 10 - 15 mins. To clean the oven you can use soap and water or an oven cleaner. The secret to oven cleaning is to clean any notable spills when you can, if you don't it is much harder later (good advice just wish I could follow it more often). If you have the self-cleaning oven, simply give it a quick wipe out then run the self clean mode, sit back and you’re done. You have two options when it comes to cleaning the griddle. After cooking drag all the excess grease and burnt on food to the front of the range. 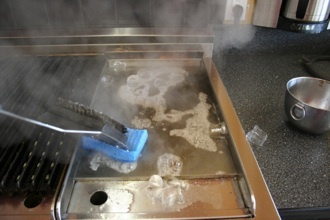 The grease and food can go down the hole provided or you can mop it up with paper towels. Then you can drop ice cubes on the griddle top and using a long implement and a sponge (rough side) move the bubbling water around the plate while scrubbing hard. Drag the food and grease to the front of the range, clean tray with paper towel, and then simply clean the plate when cool with paper towels. Over time you will build up a coating very similar to a wok and you will then find the griddle becomes non- stick. With either option, when the cleaning is done put the griddle cover over the plate for a perfect finish. The way we clean the cast iron grates on our grill in the cooking school is to leave the burner on full for 20 minutes after cooking then rub them like crazy with a wire brush. This will remove all the charred food. 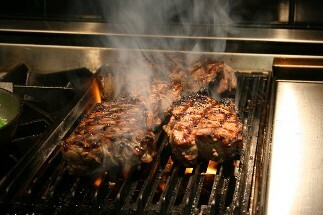 The grill also has a drip tray, clean this the same as the burner drip tray. I would highly recommend that you line the drip trays with aluminum foil; it makes it so much easier to rip it out and replace the foil with new. 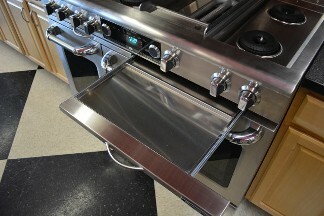 The drip trays under the burners and the grill or griddle come in two sections just in case you forget to line them one time. Clean up is not a big deal, wash them with soap and water and a sponge or put them in the dishwasher.